After many months of development and testing, CorkSport is pleased to introduce you to the CorkSport Single Exit Exhaust for the 2004-2008 Mazda RX-8! The CorkSport Mazda RX-8 single exit exhaust provides a deep, bold tone that is aggressive at idle and provides a powerful impression throughout the throttle range. Our RX-8 exhaust is built using quality material and construction methods. 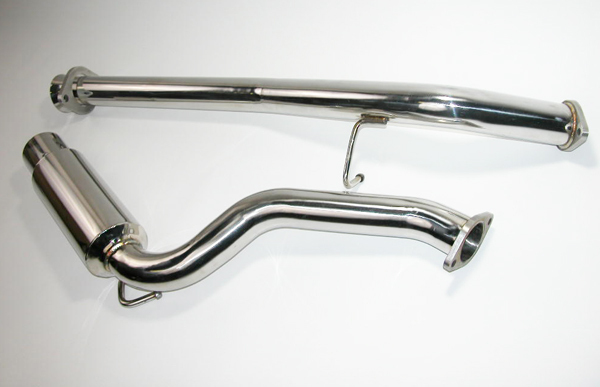 It is constructed using polished 2.4” mandrel bent stainless steel piping to improve exhaust flow and provide more power and finished with TIG welds for a strong connection and good looks. As with all our CorkSport parts, the Mazda RX8 Single Exit Exhaust comes with a two year limited warranty, superior installation instructions, and reliable technical assistance should you need it during your install. I want to buy a single exit cork sport for my rx8 but where do I get it?? I want to get one too, but I can’t find them for sale anywhere either. The exhaust was discontinued after several batches. Sales for the exhaust dropped off unfortunately which proved to be the death of it. HKS still offers a single exit model. Previous PostPrevious iPhone 5 – Do you want the box? Next PostNext CorkSport Texas Mazda Showdown!